Gun groups on both sides of the issue responded to President Donald Trump's nomination of Brett Kavanaugh to replace Justice Anthony Kennedy on the Supreme Court on Monday. Gun-rights proponents were universally supportive of the nomination while gun-control advocates roundly rejected it. The National Rifle Association, National Shooting Sports Foundation, and Second Amendment Foundation all released statements praising Trump and Kavanaugh shortly after the announcement was made. Likewise, Everytown for Gun Safety and Giffords released statements slamming the move. The NRA said Kavanaugh's record was "impressive" and praised his support for the Second Amendment. "President Trump has made another outstanding choice in nominating Brett Kavanaugh for the U.S. Supreme Court," Chris Cox, executive director of the NRA's Institute for Legislative Action, said. "He has an impressive record that demonstrates his strong support for the Second Amendment. Judge Kavanaugh has demonstrated his clear belief that the Constitution should be applied as the Framers intended. To that end, he has supported the fundamental, individual right to self-defense embraced by Justice Scalia in the historic Heller decision." SAF founder Alan Gottlieb believes Kavanaugh's confirmation to the Court will usher in a new era of rulings on key gun-rights issues. "We're encouraged by this nomination because, by adding Judge Kavanaugh, we might see the High Court become more willing to accept and rule on important Second Amendment issues, such as right-to-carry," Gottlieb said. "While the Supreme Court has twice affirmed in the last 10 years that the Second Amendment protects a fundamental, individual right to keep a firearm for home defense … the Court has yet to even begin defining the right to bear arms outside of the home or business, in public. We know that the Court will face enormous challenges on other rights issues but the right to keep and bear arms is a cornerstone of the Bill of Rights that has set this nation apart as a beacon of freedom and liberty. It is time for the Court to examine the constitutionality of various state laws that restrict the right to carry, for example, and make arbitrary decisions about who can exercise that right." The NSSF said they believe Kavanaugh will protect gun rights if confirmed. "We are pleased to lend our support to President Trump's nomination of Judge Kavanaugh to the Supreme Court," Lawrence Keane, NSSF senior vice president and general counsel, said. "We are confident that Judge Kavanaugh will serve our nation with distinction as an associate justice of our nation's highest court and that he will make decisions that will serve to protect the Second Amendment and other constitutionally guaranteed rights of law-abiding Americans." Conversely, Everytown told its supporters, "Trump may have just handed the NRA another Supreme Court Nominee." The gun-control group described Kavanaugh's record as "troubling" and called on its supporters to contact their senators and encourage them to vote against his nomination. 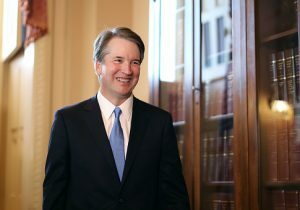 "Judge Brett Kavanaugh's extreme outlier approach to the Second Amendment would elevate gun rights above public safety and put in jeopardy the full range of gun-safety laws—including assault weapons and large-capacity magazine prohibitions, minimum age requirements, safe storage requirements, and other common-sense gun safety laws," Everytown said in a message to supporters. "We need to do everything we can right now to tell our senators to OPPOSE Trump's SCOTUS pick. Stephen, send an urgent message to your senators—tell them to OPPOSE Judge Brett Kavanaugh's nomination for Supreme Court justice." Giffords, the gun-control group named for and headed by former congresswoman Gabby Giffords, said Kavanaugh would be beholden to the "gun lobby" and put "corporate interests before public safety." "In nominating Judge Kavanaugh to be the next Supreme Court justice, the Trump administration is once again showing brazen disregard for the people it claims to protect," Giffords said. "Judge Kavanaugh's dangerous views on the Second Amendment are far outside the mainstream of even conservative thought and stand in direct opposition to the values and priorities of the vast majority of Americans. America needs a Supreme Court justice who respects the Second Amendment but who also realizes reasonable regulations that reduce gun violence do not infringe on anyone's constitutional rights. But that's not the kind of justice President Trump nominated today." The NRA said it would be mobilizing its 6 million members and other gun-rights supporters to support the nomination and called for a prompt confirmation process. "We urge the Senate to swiftly confirm Judge Kavanaugh to the U.S. Supreme Court, just as it confirmed him to the U.S. Court of Appeals for the District of Columbia Circuit," Cox said. "We will be activating our members and tens of millions of supporters throughout the country in support of Judge Kavanaugh. He will protect our right to keep and bear arms and is an outstanding choice to fill Justice Kennedy's seat." The NSSF said it would "urge the Senate to approve his nomination before the next term begins on the first Monday in October."